To mark the 25th anniversary of the 9F movement, perhaps the finest quartz calibre in the world, Grand Seiko has unveiled a pair of limited editions. 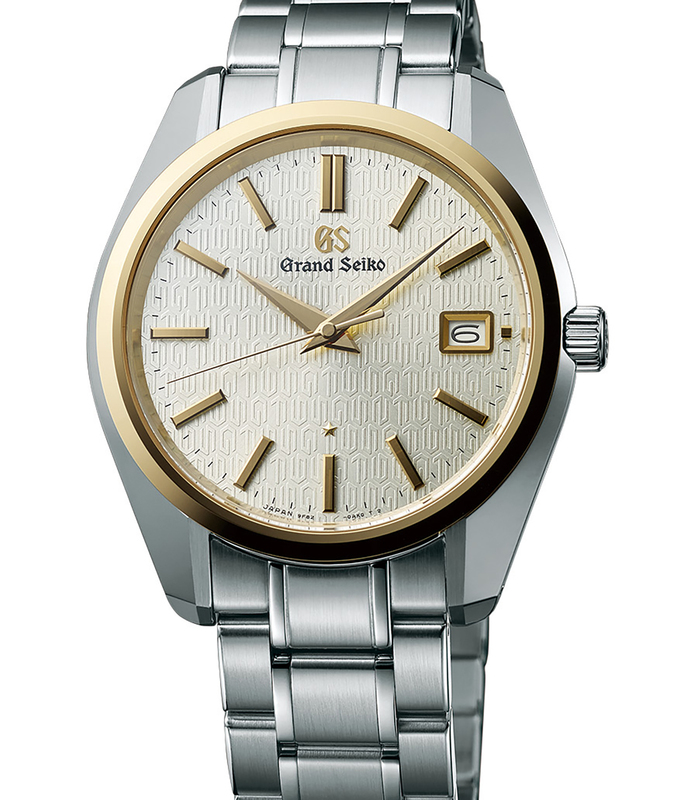 The SBGT241 in steel is a remake of the first Grand Seiko quartz with the 9F movement that was launched in 1993, while the SBGV238 in steel and 18k gold is a “modern interpretation” of the original, with the added feature of an exhibition case back, something that’s almost never found on a quartz watch. 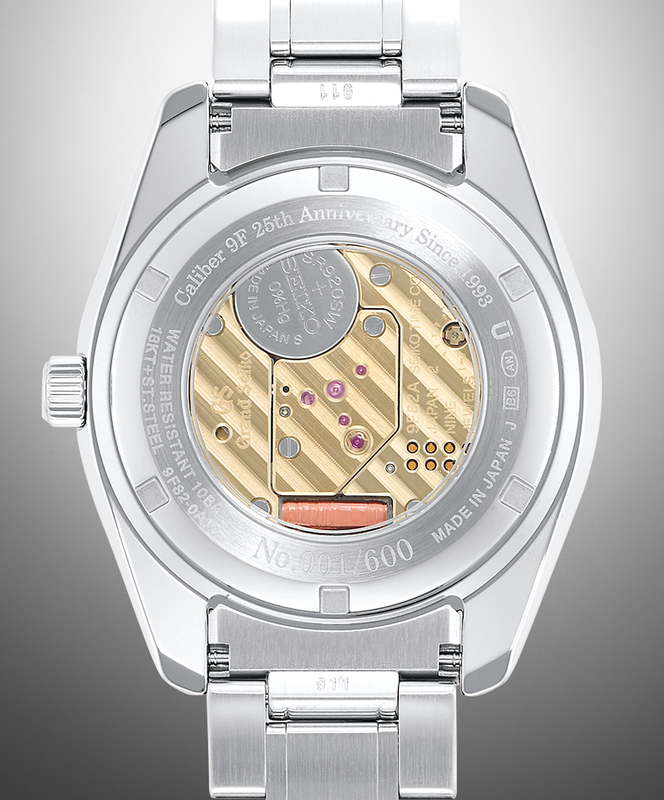 Built on the foundations of the 95GS of 1988 – the first ever quartz movement in a Grand Seiko – the 9F was the first of a new generation of quartz calibres. Then the highest-spec, commercially available quartz movement in the world, the 9F boasted an accuracy, construction and craftsmanship that, at the time of its 1993 debut, were unheard of in a quartz watch. The 9F was regulated to an astonishing +/- 10 seconds per year – equivalent to the daily rate of the average mechanical movement – while an ordinary, high-quality quartz movement runs to +/-15 seconds a month. A crucial factor behind that accuracy is the fact that the 9F calibre is thermo-compensated, meaning the rate variation due to temperature fluctuations is programmed into the integrated circuit. Not only is the 9F assembled and decorated entirely by hand, just like a mechanical watch, it is also surprisingly mechanical. The date change is instantaneous, relying on a cam and lever. The hour and minute hands feature a backlash auto-adjustment mechanism to minimise backlash and play between the hands, eliminating the “floating” hand syndrome, a common problem with quartz watches. And the higher torque generated by the movement, which is released in twin micro-steps every second, allows the hands to be thicker and wider than regular quartz watches. All of that tech is protected in a “sealed cabin” to minimise dust contamination during battery changes. 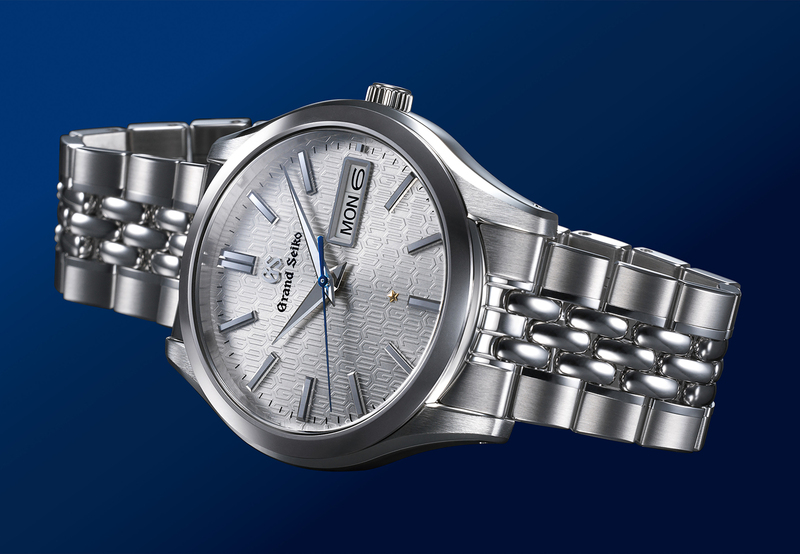 The Grand Seiko Caliber 9F 25th Anniversary (ref. 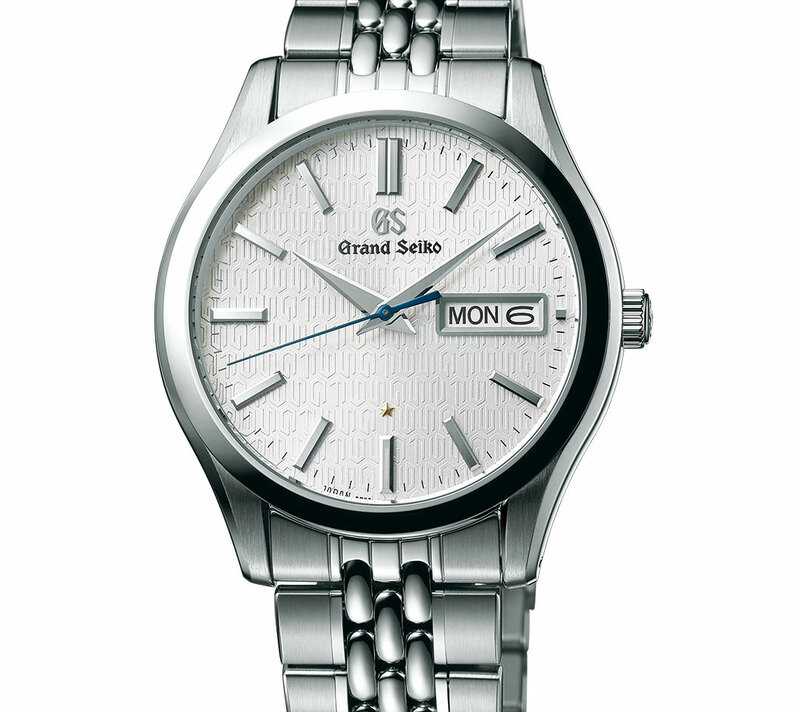 SBGT241) in steel is limited to 1500 pieces and pays homage to the 1993 original save for a few concessions to modernity. The case has been bulked up slightly to 39.1mm. The Grand Seiko logo – as with every other Grand Seiko watch since it became standalone brand in 2017 – is now at 12 o’clock. And then there is the dial, which is replete with nerdy references to the 9F movement. It is embossed with geometric motif that is inspired by the double-V logo used by Seiko in the past to indicate a quartz movement. But the motif is actually made up of the recurring text “GS 9F”. At five o’clock, the pattern changes subtly to read “9F 25” instead. And at six o’clock sits the five-pointed star logo, found on Grand Seiko quartz watches that are regulated to +/- 5 seconds a year. Otherwise, the look is close to the original, right down to the “beads-of-rice” bracelet. The watch is powered by the 9F83 (which is the 9F with day and date display) that is hidden under a solid case back inlaid with an 18k yellow gold medallion bearing the Grand Seiko lion logo. The Grand Seiko Caliber 9F 25th Anniversary 44GS (ref. SBGV238), on the other hand, is limited to 600 pieces. The case itself is a modern interpretation of one of Grand Seiko’s best known models, the 44GS of 1967 that was characterised by its wide, polished lugs. Here the case has been made more angular with broader sides, and measures 40mm in diameter. While the case and bracelet are in steel, it has an 18k gold bezel with matching gold hands and indices. 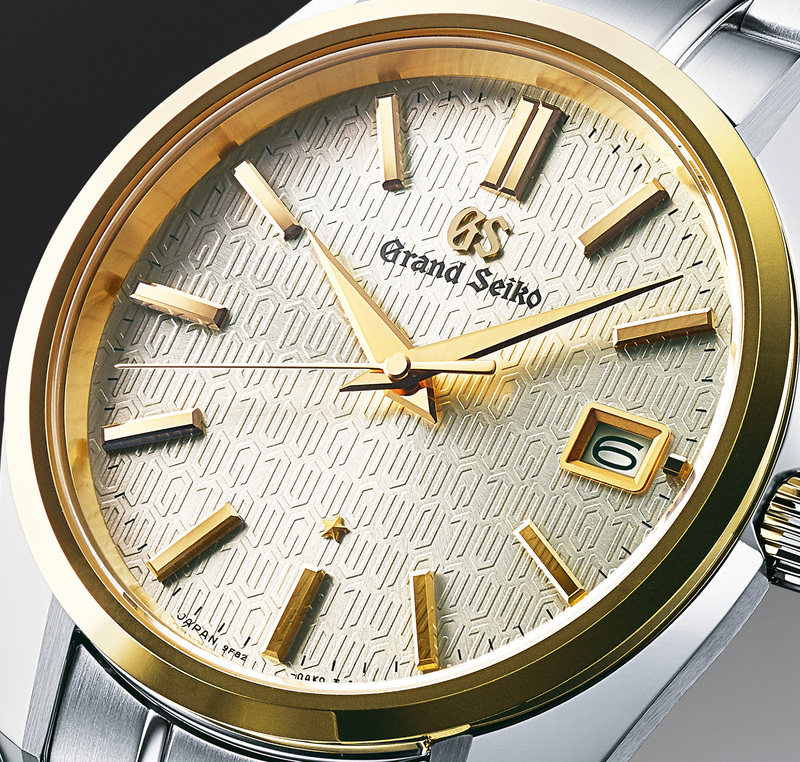 The dial is decorated with the same “GS 9F” motif as found on the first commemorative model, and also features the 18k gold star denoting the enhanced precision of the 9F82 inside. Perhaps the best thing about it is the sapphire back that shows off the 9F82, with its Geneva stripes and train jewels. The steel SBGV238 is limited to 1500 pieces and priced at ¥350,000 or €3700. It will be available April 2018. The steel and gold 44GS SBGV238 is limited to 600 pieces, with a price of ¥500,000 or €5000 and delivery date of May 2018.